dietary preferences. Diners also appreciate Duke’s nearly 175 beer choices, mostly from artisan producers. 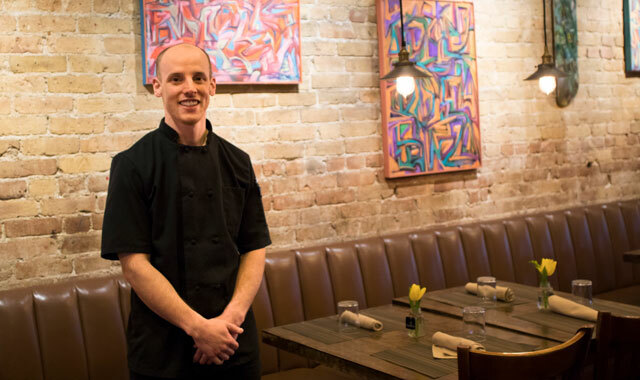 Zak Dolezal has worked hard to make his mark as chef-owner of Duke’s Alehouse & Kitchen, 110 N. Main St., Crystal Lake. Since assuming the reins in 2008, he’s made a priority of sustainable practices and the sourcing of organic and locally grown ingredients. The 35-year-old Dolezal believes he took a risk adjusting the menu, but says it’s paying off at this popular establishment. Dolezal got his first taste of the restaurant business as a child. He remembers occasionally shadowing his mother in the family’s kitchen and spending time tending bar, cooking and doing janitorial work at Durty Nellie’s Irish Pub in Palatine, an establishment founded by his father. “However, growing up to be a chef wasn’t something I planned,” says Dolezal. As it turned out, Dolezal discovered he did have a calling for a career in foodservice. He polished his skills while enrolled at Kendall College’s culinary school. In 2001, he graduated and began studying hospitality management at Purdue University. Afterward, he worked at restaurants around the Chicago area, including with Marriott and Lettuce Entertain you. In 2008, he joined Duke’s Alehouse – another of his family’s restaurants. Today, Duke’s grass-fed beef burgers remain one of the most popular dishes at the 100-seat Duke’s Alehouse. The organic bison burgers also have a strong following, and many a diner enjoys the steamed mussels with rogue chipotle ale, garlic and chipotle chiles. Duke’s full-service bar serves a dozen quality wines and specialty cocktails. But the bar’s real strength is in its eclectic beer inventory. It stocks anywhere from 150 to 175 beers, including 21 draft choices. Some mainstream brewers are represented, but most labels are hard-to-find artisan breweries from regional producers such as Indiana-based Three Floyds Brewing Co., maker of Zombie Dust, an American pale ale. Entertainment varies from trivia on Wednesday and live jazz Thursday to karaoke on Friday and rock bands on Saturday. The eco-conscious gastropub’s decision to get serious about water efficiency, waste reduction and energy use has not gone unnoticed. The Green Restaurant Association has accorded Duke’s Alehouse a coveted three-star rating. The cozy downtown venue draws customers from Crystal Lake and the surrounding area, including Barrington, Algonquin and Schaumburg. Dolezal says that employee retention is a challenge in this business, but something he constantly addresses. “To a degree, treating our 50-member staff well and promoting from within has helped keep turnover low,” he says. The intimate dining room has seating along the outer walls and near the large entertainment stage. A loft upstairs has dedicated space for private parties of 50 to 100 people. Duke’s Alehouse & Kitchen is open daily for lunch and dinner. The kitchen is open Sun.-Thu. 11:30 to 9 p.m. and Fri.-Sat. to 10 p.m. The bar is open Sun.-Thu. until 1 a.m. and Fri.-Sat. to 2 a.m. Reservations are accepted. This entry was posted on Wednesday, February 15th, 2017 at 11:59 am	and is filed under Dining Guide. You can follow any responses to this entry through the RSS 2.0 feed. Both comments and pings are currently closed.